"The goals of green computing are similar to green chemistry; reduce the use of hazardous materials, maximize energy efficiency during the product's lifetime, and promote the recyclability or biodegradability of defunct products and factory waste. Research continues into key areas such as making the use of computers as energy-efficient as possible, and designing algorithms and systems for efficiency-related computer technologies. 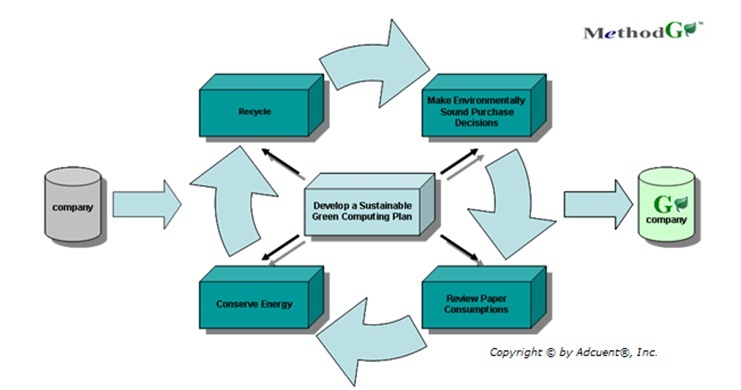 Green computing is the environmentally responsible use of computers and related resources. Such practices include the implementation of energy-efficient central processing units (CPUs), servers and peripherals as well as reduced resource consumption and proper disposal of electronic waste (e-waste). One of the earliest initiatives toward green computing in the United States was the voluntary labeling program known as Energy Star. It was conceived by the Environmental Protection Agency (EPA) in 1992 to promote energy efficiency in hardware of all kinds. The Energy Star label became a common sight, especially in notebook computers and displays. Similar programs have been adopted in Europe and Asia. 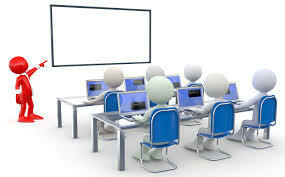 A thin client (sometimes also called a lean or slim client) is a computer or a computer program which depends heavily on some other computer (its server) to fulfill its traditional computational roles. This stands in contrast to the traditional fat client, a computer designed to take on these roles by itself. The exact roles assumed by the server may vary, from providing data persistence (for example, for diskless nodes) to actual information processing on the client's behalf. 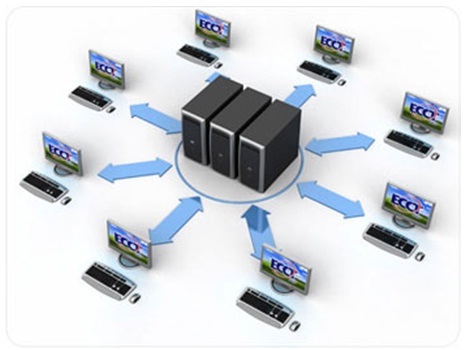 Thin clients occur as components of a broader computer infrastructure, where many clients share their computations with the same server. As such, thin client infrastructures can be viewed as the amortization of some computing service across several user-interfaces. This is desirable in contexts where individual fat clients have much more functionality or power than the infrastructure either requires or uses. This can be contrasted, for example, with grid computing. The most common type of modern thin client is a low-end computer terminal which concentrates solely on providing a graphical user interface to the end-user. The remaining functionality, in particular the operating system, is provided by the server. Thin clients have their roots in multi-user systems, traditionally mainframes accessed by some sort of terminal computer. As computer graphics matured, these terminals transitioned from providing a command-line interface to a full graphical user interface, as is common on modern thin clients. The prototypical multiuser environment along these lines, UNIX, began to support fully graphical X terminals, i.e., devices running X server software, from about 1984. X terminals remained relatively popular even after the arrival of other thin clients in the mid-late 1990s. Modern UNIX derivatives like BSD and GNU/Linux continue the tradition of the multi-user, remote display/input session. Typically, X server software is not made available on thin clients; although no technical reason for this exclusion would prevent it. Windows NT became capable of multi-user operations primarily through the efforts of Citrix Systems, which repackaged NT 3.5.1 as the multi-user operating system Win Frame in 1995. Microsoft licensed this technology back from Citrix and implemented it into Windows NT 4.0 Terminal Server Edition, under a project codenamed "Hydra". Windows NT then became the basis of Windows 2000 and Windows XP. As of 2011 Microsoft Windows systems support graphical terminals via the Remote Desktop Services component. Since the clients are made from low-cost hardware with few moving parts, they can operate in more hostile environments than conventional computers. However, they inevitably need a network connection to their server, which must be isolated from such hostile environments. Since thin clients are cheap, they offer a low risk of theft in general, and are easy to replace if stolen or broken. Since they do not have any complicated boot images, the problem of boot image control is centralized to the server. On the other hand, to achieve this simplicity, thin clients sometimes lag behind thick clients (PC Desktops) in terms of extensibility. For example, if a local software utility or set of device drivers are needed in order to support a locally attached peripheral device (e.g. printer, scanner, biometric security device), the thin client operating system may lack the resources needed to fully integrate the needed dependencies. Modern thin clients attempt to address this limitation via port mapping or USB redirection software. However, these methods cannot address all use case scenarios for the vast number of peripheral types being put to use today. Thin Clients has many advantages, so different people define thin clients in different way basing one of its advantage. Below are the few common definitions & sentences people often use to define thin client. Simply, Thin Client is nothing but a computer, but with very less configuration (specifications /capacity / power), still users can able to run all the latest Operating Systems and Applications (software), with the help of SERVER Computer which is connected to it through LAN Means, In Thin Clients you need not to install any OS or Applications, you have to install Only in SERVER where all thin clients are connected to it, all the OS and Applications will run on server and results are displayed in Thin Clients (user computers) Several users can run the same program simultaneously, but the program only needs to be loaded once with a central server. In Traditional PC, We have to Install OS and Applications Locally and use its Local Resources (CPU, Ram, HDD) for its Processing and Storing, where as in Thin Client you need not install any OS or Applications in Thin Client, but you can access OS and Applications from SERVER.